No matter where you go or what you take with you there'll be no need to miss a thing with this Nike Brasilia Medium Sports Holdall in Grey. 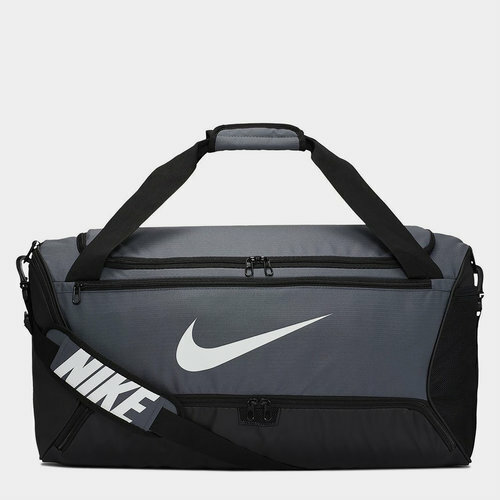 This Nike Brasilia Medium Holdall is great for carrying your items to the gym or taking on weekends away, featuring a large zipped compartment with small touch and close fastening pouch for valuables. There are two zip pockets to the sides, one of which is gusseted and ventilated for storing clothes or shoes, plus a removable, adjustable padded shoulder strap, carry handle and smaller handle to the side, giving plenty of transportation options. Nike branding completes the look.